Bermuda! Although I thought I'd stop work on it for awhile, I found it impossible to ignore. I have to make a bit more filler fabric and decide on the best block placement for the outside made fabric. I've never made this much fabric and found that I like the freedom of it. I'd like to experiment more! 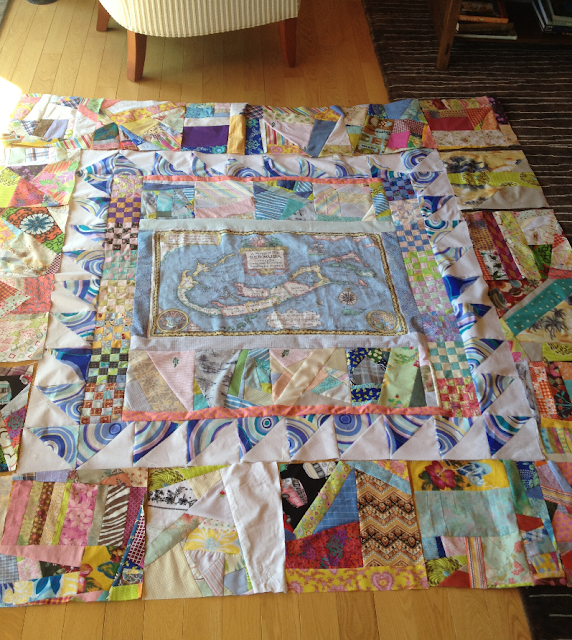 This is about 72" square right now. Fab. I've been making fabric like this, too. So fun! Love the blue and white hst's, they look like ocean waves to me. Carry on! Gorgeous! I think it's so funny when people say they can't work, or don't know how to work, with scraps. Two of us from our guild, ECMQG, had the opportunity to talk to a group of traditional quilters this past week. I can't tell you how many times I kept saying, "just play with your scraps". Wow! It looks like you've really had fun ... and maybe used up a lot of scraps, too. I really like the frame that the blue and white triangles create in your quilt. They also give your eyes a place to rest on your scrap happy piece. Really like the colour combinations it doesnt look like a tea towel at all! This is so bizarre and colorful! I really love all the energy going on here. Bermuuuda! I like it! That swirly blue fabric is PERFECT!